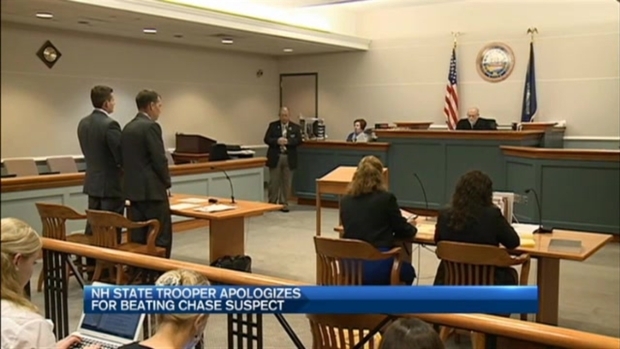 Authorities say a suspect escaped after leading officers on a pursuit early Tuesday morning in Epping, New Hampshire. State police say law enforcement officials are searching for 28-year-old David Cherry of Manchester. The chase began around 3:30 a.m. after officers pulled over a vehicle for a traffic stop and learned the driver was wanted out of Manchester for assault. The driver sped off and lead police on a chase on Route 101 westbound and then on to I-93 northbound. The driver then crashed into another vehicle while getting off exit 8. Police say the driver, later identified as Cherry, fled the scene. A K-9 was brought in to search, but he was not found. Two passengers in the suspect's vehicle were taken to a hospital with non-life-threatening injuries. The passenger in the other vehicle which was struck was also taken to a hospital with on-life-threatening injuries. Anyone with information on Cherry's whereabouts is asked to call police at 603-679-3333.